In the outer edge of lonesome banjo music lies “Last Chance,” a tune associated with the Saltville, Virginia, musician Hobart Smith (1897–1965). 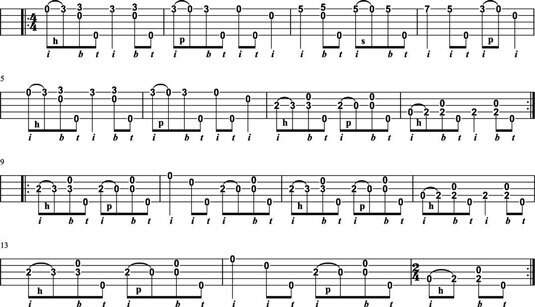 “Last Chance” has all the eccentric qualities that old-time banjo players love: its own very unusual tuning (called “Last Chance” tuning, oddly enough), a super mournful melody, and a quirky, irregular structure that qualifies it as a crooked tune, which is defined as a song that has an uneven number of beats. Heck, it’s even got a lonesome title! Tune your 3rd string down two frets from G to F.
Tune your 5th string down two frets from G to F.
Note that your 5th string should sound the same note as the 3rd string but one octave higher. Tune your 2nd string up one fret from B to C.
Tune your 4th string down two frets from D to C.
Although an electronic tuner is a great help, it’s always best to use your ear. Tuning by ear takes practice, just like any other playing technique, but you’ll be amazed at how much better you’ll be able to hear once you start listening! Try tapping your foot along to the “Last Chance” video. If you’re like most folks, you’ll feel an uneven number of beats in the rhythm at the very end, just before the tune repeats. Now take a look at the tab for “Last Chance.” Note that the time signature at the beginning of the written music indicates 4/4, but at the very last measure, the time signature changes to 2/4. It’s as if two beats have been taken away from that last measure! However, this feature is a central attraction of “Last Chance,” and it’s an important element of how the tune is supposed to be played. Many thanks to Mac Benford, who played this tune many years ago at the American Banjo Camp in Washington. Mac came up with his version after listening to Hobart Smith’s version, and the version shown here is based on Mac’s — such is the old-time way! You listen to someone’s playing you admire and come up with a version that you can play that sounds good to you.